We all know we’re supposed to replace our toothbrushes regularly. We understand that old razor blades are bad news. We even know that water filters need to be changed on a regular schedule (even if we forget, every single time). But there’s another personal item that’s just as important and that gets just as dirty and worn out. And although we use it every single day (or rather every single night), most of us neglect it for far too long. That item is your pillow. If you haven’t replaced your pillow in a while, it’s time. There are a couple of reasons for this. The first reason may not bother you too much, but the second is something you’re definitely not going to like. Pillow stuffing breaks down over time. 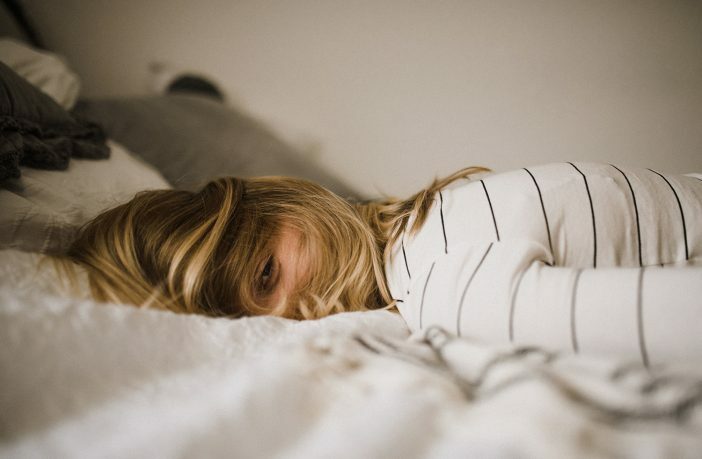 If you’ve been experiencing low quality sleep or you find you’re waking up with back and neck pain, you may not be getting the support you need. At least one study links poor pillow comfort to poor sleep quality, as well as to waking stiffness, back pain, and headaches. As we sleep, tiny particles of dead skin, along with our sweat, drool, and natural oils, find their way into our pillows. Not only can this cause the pillow to accumulate mold, fungus, and malodors, but dust mites also love this environment. They feed on the fungus and dead skin cells, then lay their eggs, poop like champs, and die. Regularly cleaning pillows and bedding helps to keep mites, mold and other allergens at bay, as does covering your pillow with a protective cover. Still, mites multiply pretty quickly and their accumulated debris can take over a pillow within as little as 6 to 12 months. Natural pillow materials help to keep dust mites and other allergens at bay, as does cleaning your pillows and covers regularly. We’ll cover each of the natural pillow stuffings, including how they support your body, so you don’t get out of bed feeling unrested and in pain. Experts recommend replacing most pillows every 12 to 18 months and advise not going past 2 years, if you can help it. That said, those suffering from allergies may want to replace their pillow as often as every 6 months, if its stuffing is not resistant to common allergens. If you’re sleeping on an inexpensive (petroleum-filled) polyester pillow, you’ll also want to make that swap every 6 months, because the filling breaks down more quickly, compromising your sleep and leaving you with headaches, stiffness, or back pain when you wake. You might also consider investing in a higher quality pillow that doesn’t need to be replaced as often. While the better pillow may cost more upfront, you’ll likely find it’s less expensive in the long run. It’s not uncommon to find pillows stuffed with polyester, memory foam, and other synthetic materials that are marketed for a “healthy sleep”. But these materials are typically made with and/or treated with polyurethane, polybrominated diphenyl ether (PBDE) flame retardants, and other unhealthy chemicals that are not conducive to a good night’s rest. You can often smell the fumes the moment you open the package, but they can continue to off-gas nearly undetected for months, perhaps even years. I say “nearly” undetected, because while you may not smell the vapors after the pillow has aired out, you can still experience their resulting skin or respiratory issues for some time. Those who suffer from allergies or chemical sensitivities tend to notice a significant reduction in symptoms by switching to a natural alternative. Pillows that are filled (and covered) with natural, organically grown fibers can still be manufactured with unwanted toxins. To fully detox your sleep, check the label or website to make sure their pillows are free from chemicals and synthetic materials. Also, look for natural pillows that are sold in a zippered cover. This allows you to add or remove fibers yourself, so you can easily customize its softness or firmness. Cotton is commonly used to fill pillows, as well as to cover them. Choose organic cotton to stay toxin-free. Conventional cotton has earned a reputation for being the “dirtiest” crop on the planet, because farmers spray somewhere around 15 to 20% of the world’s pesticides on it. It’s also extremely water intensive and is often manufactured and dyed with even more chemicals. 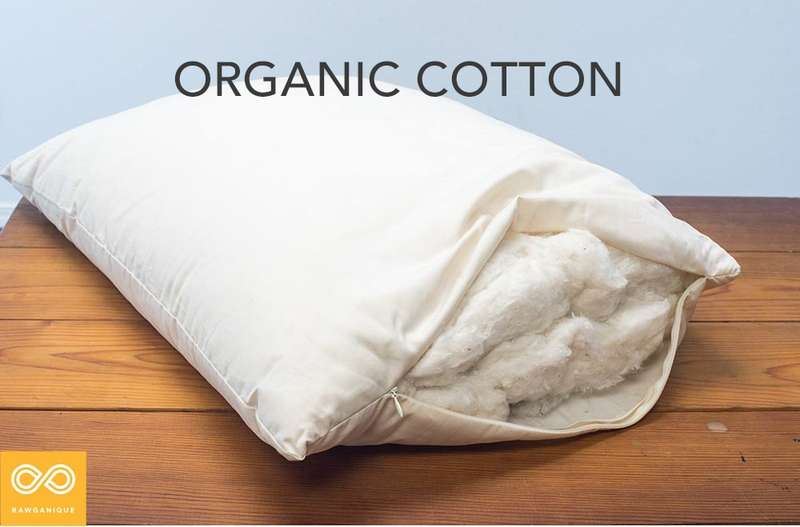 By contrast, organic cotton has been grown without the use of pesticides, it requires far less water and, if the final product is also certified as organic (as opposed to just “filled with organically grown cotton“), the entire pillow would be free from harmful chemicals. Big difference, right? Soft tends to be best for those who predominantly sleep on their belly. Medium is a comfy choice for back sleepers. Firm is great for side-sleepers. There are two types of latex pillows. Both conform to your head and neck and help to support your spine and both are naturally resistant to mold, mildew, dust mites, and other allergens. 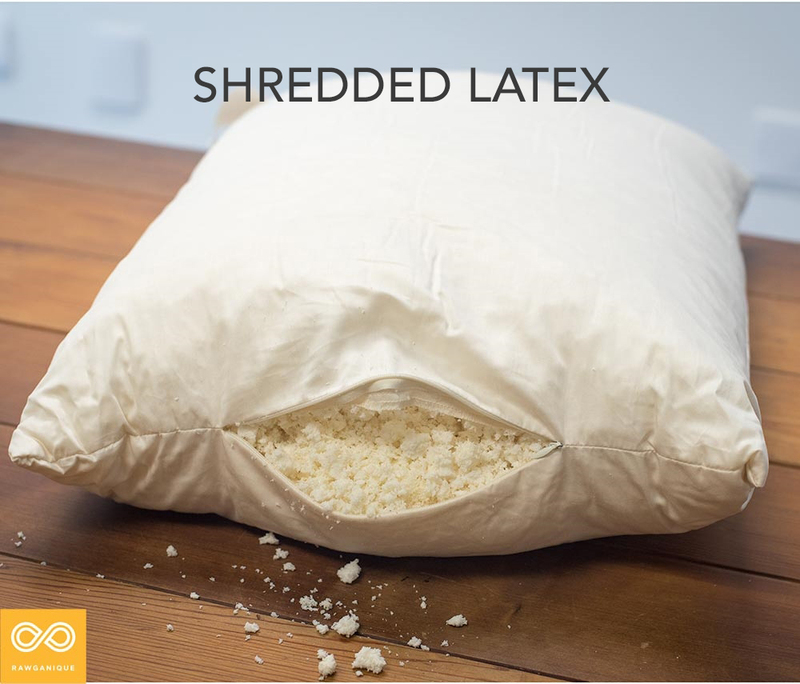 Solid latex pillows can warm up quickly, so if you like to keep things cool, make sure the solid latex pillow comes with venting holes, or opt for shredded latex instead. To ensure the pillow is also free from chemicals, be sure it’s labeled as 100% pure latex, and not a latex blend or biofoam. Synthetic latex and their blends (including soy foam and biofoams) are often made from chemicals you don’t want to inhale all night. By contrast, natural latex is tapped from the ‘hevea brasiliensis‘ rubber tree. 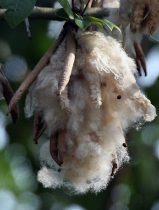 Kapok is a fluffy, luxurious, cotton-like fiber harvested from the tropical ceiba (kapok) tree. 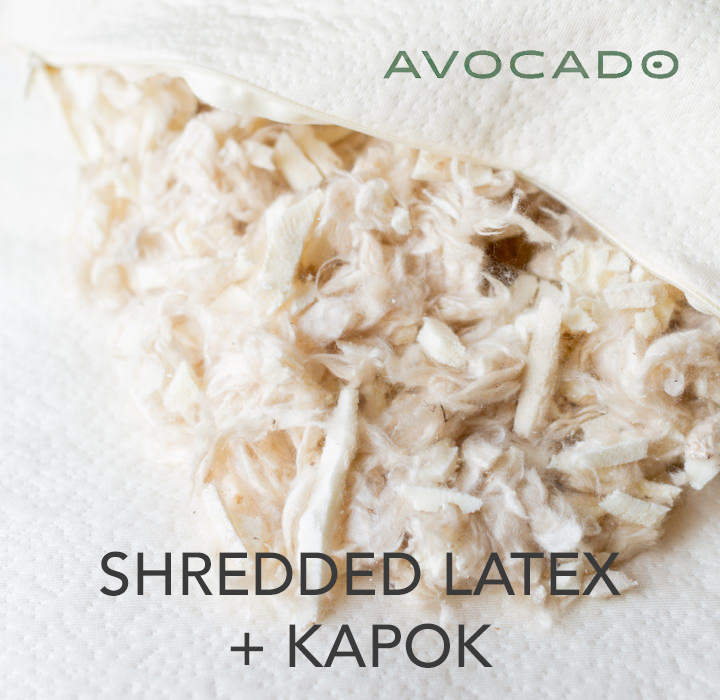 While it feels like down when stuffed into a pillow, it is unlike down in that kapok is 100% plant-based and 100% cruelty-free. Although fluffy and high loft, kapok is also firm, making it a great option for both back and belly sleepers. Kapok is also quick-drying, hypoallergenic, and naturally resistant to mold, mildew, and dust mites. Kapok is wild-harvested, rather than cultivated on a farm. 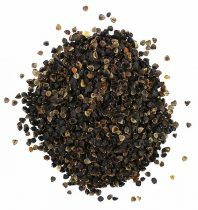 It is naturally pest-free and requires no processing when it’s used as a pillow stuffing. (It may require some processing when used as a fabric.) But for stuffing, pillow makers only need to wash away any debris, dry it well, and shove it in the pillowcase. It doesn’t get more natural than that! Wool is a strong, durable fiber that makes for a firmer pillow, appreciated by side sleepers. It naturally wicks away moisture and regulates your temperature while you sleep, keeping you cool in summer and warm in winter. Wool is also naturally resistant to fire, bacteria, mold, mildew, and dust mites. And when the wool is untreated, it’s also hypoallergenic. Ideally, look for wool that has been ethically sourced to protect the safety and welfare of the sheep, as well as the land on which they were raised. Check the brand’s website to learn how they source their wool and follow The Responsible Wool Standard. 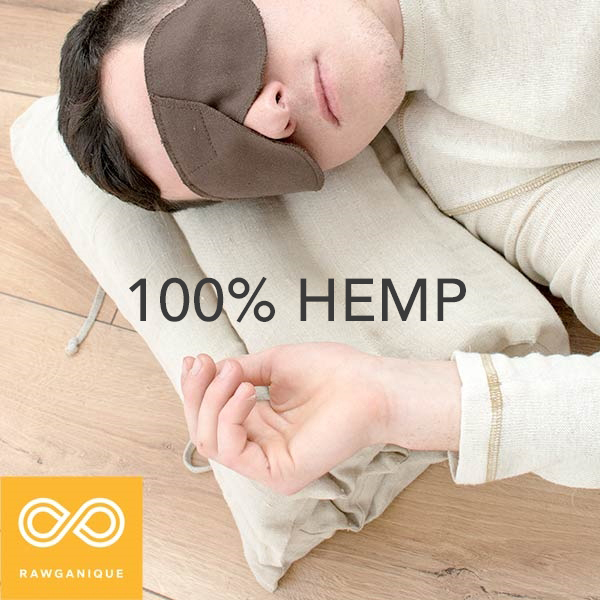 Hemp (cannabis sativa) is used as both a pillow stuffing and as a cover. As a filling, hemp pillows can feel like cotton — soft, durable, and yet not too lofty. It’s great for back and side sleepers and its hollow core helps it to regulate airflow and body temperature as you sleep. As a cover, hemp can be a little rough at first, but it softens with each washing without degrading the fabric. Hemp is also extremely durable, breathable, and naturally resistant to mold, mildew, and insects (including dust mites). 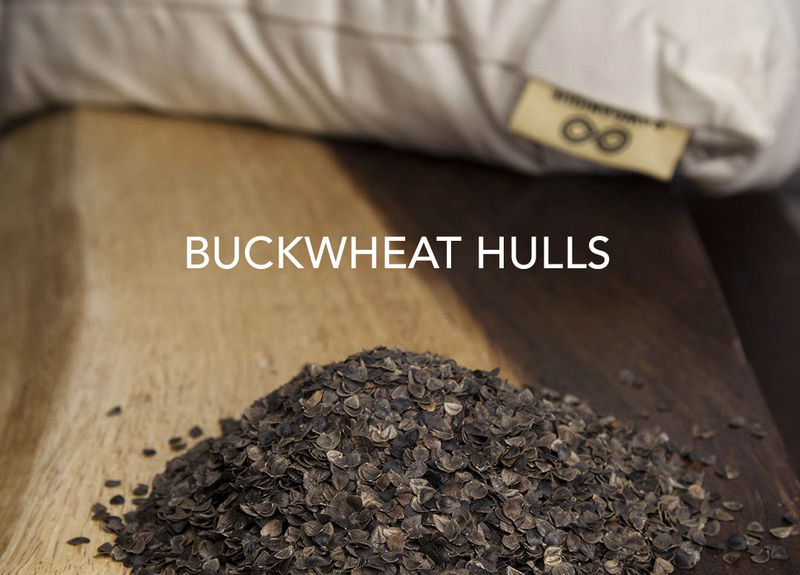 If you’ve ever laid your head on one of those heavy-ish pillows in yoga class, then you know how relaxing and comfortable a buckwheat pillow can be. And if you like to get your zen on, you may want to know that buckwheat pillows are also popular as meditation cushions. 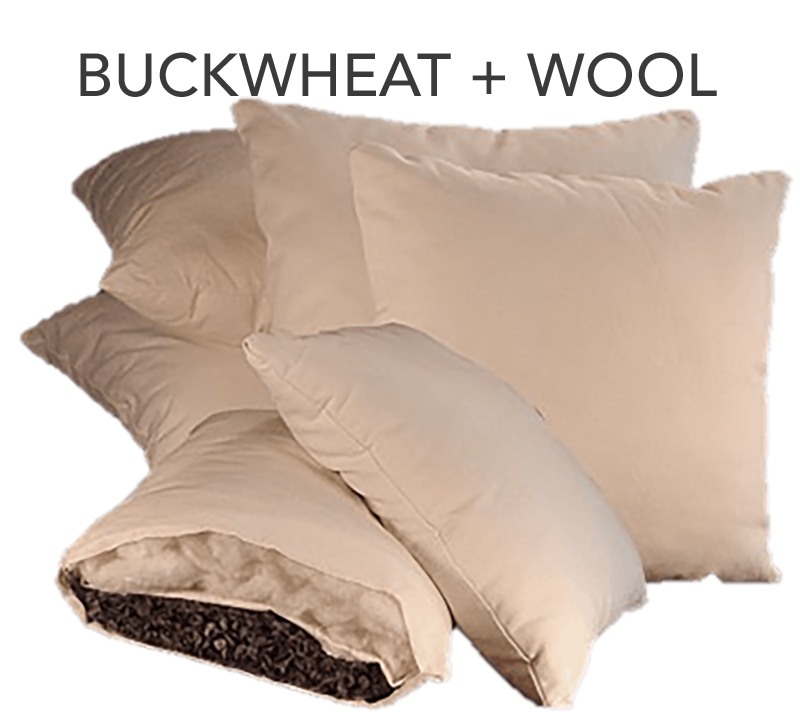 Preferred by back and side sleepers, buckwheat pillows are firm and moldable. They provide excellent head and neck support and the hulls allow for greater breathability, which is especially nice during the summer months. Tip: Put the pillow in the freezer for a couple of hours before bed to keep the pillow – and your head – extra cool in summer. While I’ve seen mixed reviews around the web, buckwheat pillows are said to help to ease migraines, snoring, muscle tension, and stress. Some people swear by buckwheat for these reasons, while others don’t seem to notice any change in their symptoms. I can’t be sure, but I suspect the difference among users may have something to do with the quality of the pillow, where the higher quality provides noticeable benefits and more comfortable sleep. Personal preference also plays a role. The hulls do make some noise as you (and the hulls) move around at night. Some find that it disturbs their sleep, while others find it extra relaxing. They say it’s like being at the beach and has almost the same sound as when you fall asleep laying in the sand. For those who like the feel of buckwheat pillows, but not the sound, opt for wool covering (instead of cotton or hemp) to help muffle the noise. Also, don’t forget that if the pillow feels like it’s a bit too high, you can simply unzip the cover and remove some of the hulls. You can even move them around a bit as you lay your head down, so it conforms exactly to your liking. Allergy sufferers should note that there is some debate over whether buckwheat pillows are hypoallergenic and resistant to dust mites. While mites have been found to accumulate in buckwheat pillows, at least one study believes this may be due to how the buckwheat is prepared. They say that pillow manufacturers in Korea do not wash the husks, so it’s likely that the buckwheat flour residue left behind is what attracts mites and other allergens. While they only tested pillows made from a single Korean brand, they go on to say that US manufacturers do thoroughly clean the husks, and that they would be interested to see whether a broader study would find different results based on how the buckwheat had been cultivated, stored, and produced. There are down pillows, feather pillows, and combo down + feather pillows. Down comes from the dense, fluffy undercoat beneath the bird’s larger feathers. That bird is typically a goose or duck. Down pillows are pretty durable, despite being so soft and light. They also offer decent head and neck support, when fluffed and molded into the right position. And because they conform easily, they tend to work well for back, front, and side sleepers. All this said, down pillows have some strong drawbacks… and they aren’t just about the inhumane plucking. Unlike other natural alternatives, down is NOT resistant to mold, mildew, or dust mites. While many folks believe they are allergic to down, it is likely the allergens that reside in the down that are the real culprit. Thanks to these unwanted tenants, it’s recommended to replace them every 6 months. Unfortunately, a good down pillow isn’t cheap, which is something to keep in mind if you’re on a tight budget. Keeping these allergens at bay isn’t easy, because down pillows can be difficult to clean. 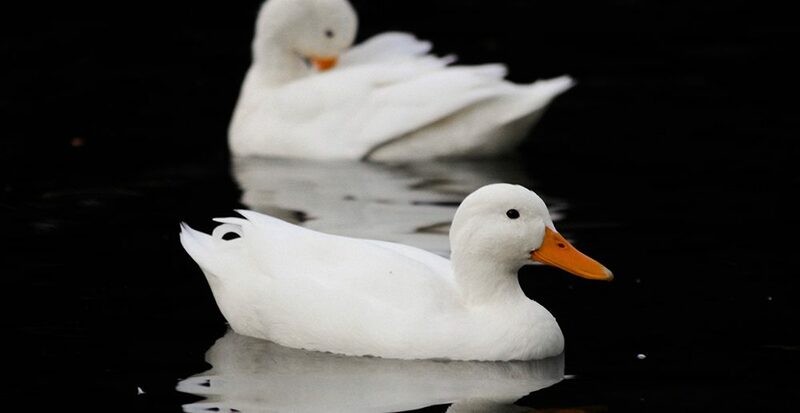 Despite the fact that ducks and geese live in water, the pillows can pick up some serious stink if they’re left wet for too long. They also singe pretty easily, so you can’t dry them quickly under a hot setting; you have to dry them on cool or let them air out under a sunny window. The down in pillows (as well as in comforters) is also notorious for clumping up when washed. This clumping can cause the pillow to flatten in some areas, while becoming lumpy in others. Feather pillows experience the same downsides as pure down, plus one more: the sharp quills tend to poke your face through the pillowcase. If you’ve never slept on a feather pillow, I can tell you firsthand, those quills really hurt! And while I’ve never had one poke me in the eye, I do find it unnerving how easy it would be. Beyond their technical difficulties, down and feathers are usually harvested in an inhumane way. Sometimes the down is plucked from the bird after it’s been killed for its meat. Other times the bird is painfully plucked while it is still alive. And a final method is to hold the bird down by its neck and comb out any loose feathers… often quickly and aggressively, in order for the factory workers to get the job done ‘efficiently’. If you do purchase down pillows, be sure to read the label or website carefully to make sure the down was sourced in the most ethical way possible, which is post-mortem. Still, do be aware that there is no guarantee. Brands, such as Patagonia, that source their down ethically (or so they thought) were shocked to learn their suppliers weren’t as ethical as they claimed. If you love your down pillow, but can’t stomach the idea of where the down comes from, you might try buckwheat hulls or kapok. 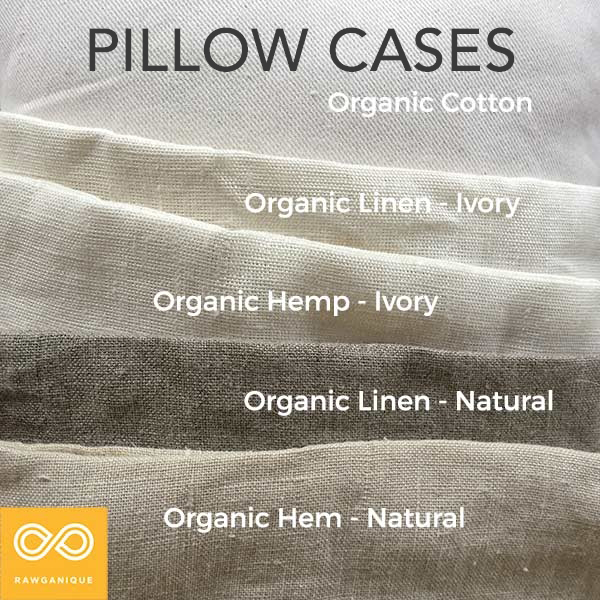 Organic cotton, flax linen, and hemp are excellent options for healthier pillowcases and sheets. Still, metallic dyes and chemical colorants can add unwanted contaminants to these otherwise natural materials. Check that your bedding is naturally dyed with botanicals (plants) and minerals or with GOTS-safe colorants, or that it’s labeled as unbleached/undyed. Regardless of the type of pillow you buy, you’ll need to keep it clean and protected, so that it stays healthy and supportive until it’s time to buy again. Washing pillowcases and sheets weekly will help to kill off mites and clean away acne-causing oils and bacteria, as well as asthma-causing fungus. A zippered pillow protector also helps to keep these contaminants away from your pillow and, depending on the material, can also help to keep it dry for those who sweat or drool. Note that some pillows can be washed, others are recommended to spot clean only. It just depends on what the pillow is filled with and the material used to encase it. Always check the label or the brand’s website before throwing their pillow into the washer or dryer. If your pillow is labeled as safe for the washer, you’ll want to set it to the gentle cycle and wash in cold water. Use only soapnuts or a small amount of natural detergent, as too much soap may not rinse from the pillow. If the pillow still feels or sounds sudsy when you squish it, put it through a second rinse cycle to flush any remaining detergent. To dry your pillows, lay them flat on a towel in a warm, sunny spot and (weather permitting) open the windows, allowing the fresh air to speed the drying time. If the label indicates that the pillow is safe for the dryer, keep it on low. You can also throw in some wool dryer balls to keep the pillow stuffing from clumping up. Whichever method you use, be sure the pillows are fully dry, so you don’t attract any mold, fungus or bacteria. It’s nice to know there are so many natural options for every type of sleeper to enjoy. Remember, if your pillow is older than 12 to 18 months, it’s time for a change. And if you notice you’ve been waking unrested, stiff, or congested, your pillow stuffing may have already broken down, so consider replacing it even sooner. Choosing a natural pillow alternative will help to keep toxins, dust mites, and allergens at bay, contributing to a healthier and more restful night’s sleep.